Today – 26th September 2018, Lighthouse Global Health Initiative (LGHI) joins the international community to celebrate this year’s World Contraception Day. On a day like this, it is important for all of us as stakeholders in family planning advocacy to synergize and renew our commitment to ensuring that every pregnancy is planned, deliberate and wanted. 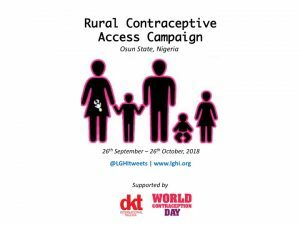 In line with the vision of LGHI – to ensure that vulnerable populations (rural/slum dwellers, adolescents, women) lead healthy and productive lives, we are excited to commence the implementation of a 4-weeks Rural Contraceptive Access Campaign (RCAC) in selected rural communities in Osun state with magnanimous support from DKT Nigeria.